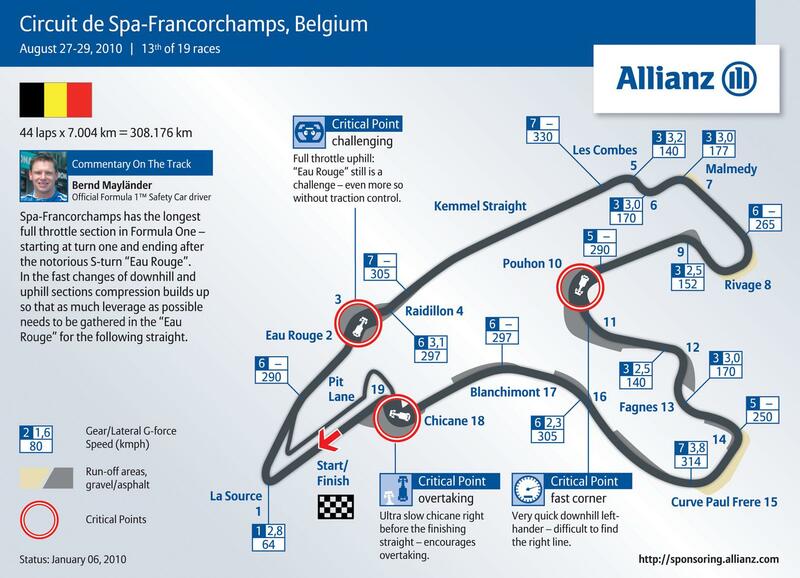 Spa Francorchamps is a racing venue in Belgium with 101 laptimes.This page represents the 7.0 kilometer (4.4 mile) configuration of this track. Spa Francorchamps is a fast track, with overall average speed of 162 kph (101 mph). 2:45.00 Spa Francorchamps Porsche Carrera GT, stock tires: michelin pilot sport. Porsche has released the on-board footage of one of Neel Jani’s laps of Spa-Francorchamps in the Porsche 919 Hybrid ‘Evo’ last month. The one in the video is two seconds slower than the 1:41.770 he set later on – for that lap the team took the camera out of the car to save uneccesary weight! New record by Porsche 919 Hybrid Evo: 1:41.77! Where is the 919 Tribute? Chris Harris did 2:53 in a lightweight E Type. Radical SR3 SL road tires Kumho V70A, driver Nicko Verdonck + pax, 869kg 225 hp (at the rear wheels) in 2015. First time on track ever yesterday in wet/drying conditions. 991 Carrera 2. 3:13 lap time with traffic. Very pleased and looking forward to going back! More a case of drivers. The 430 Scud was 1up with pro. Whereas many of the other times are 2up with non-pros. I have it on good authority that some of them aren't even close to the best non-pro laps, they're just the best on video. How is it impossible when which one is better is an opinion?.. In Grand Tour Eboladrome lap I recall Vulkan having weird engine noise like it had traction control on in the slow turns. I don't know if the tyres are street legal, but at 2:23 they definitely have tread. In fact judging by the pattern, I'd guess they are Cup 2s. 2:35 & 2:43 - They are definitely Michelin Cup 2s. So much for all the theories about them not being very sticky. BR2+ - Nobody is seriously going to attempt such a thing anyway, be serious. The statement in the video I watched said upside down at 190mph. Says upside down at 200mph in this video at 5:15. The Koenigsegg would only have 215.5kg at 100mph (660kg at 175mph). At 200kph, the Vulcan has about twice as much downforce as the One. First of all, I believe the quote was 1324kg of downforce at 320kph. Hardly enough to "drive upside down". At 160kph it would have 1/4 of that, i.e. 340kg of downforce. Hardly too much a difference to the 230kg of downforce the koenigsegg would have. But if it were cup2 tires, good for the Vulcan. I honestly was a bit disappointed at the laptimes from both the Topgear and the GT. The Vulcan has enough downforce to drive upside down at 190mph though. i doubt the Vulcan was on street tires. It was doing Au rouge at 200kph and consistently pulling 1.8+g's. In contrast the one:1 would go through Au rouge at 160kph.